My 12 year old daughter and I was walking on a road out in the country. I was pulling 3 wagons full of my childhood toys. Up ahead there was our house and there was car driving infront of it that was a man that I have dated off and on and I knew he was looking for me. When I realized it was him I handed the wagon handles to my daughter (because I did not want him to see they were mine) That was the end of the dream. 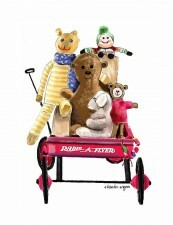 Pulling three wagons full of childhood toys, suggests you liked to play as a child. Perhaps you are still playing, only the games you are playing today have changed somewhat since you were a child. You hand off the wagons to your daughter, is that because you do not want to appear immature? I guess we all worry at times what others may think of us. There are other ways to interpret the handing off of the wagons to your daughter, however I would need some personal associations from you. From a psychological perspective one of the first popular psychology books I read as a student was Eric Berne's Games People Play, his ideas may provide an explanation for your dream. You appear to be trying to hide your toys from a man who has been a past love interest. Consequently we all learn to hide a great deal from others vision. The Scottish psychiatrist Ronald D. Laing The Divided Self believes that this strategy of hiding aspects of ourselves from others lays the foundation for a false self and self deception. Other dreams received by the International Institute for Dream Research (IIDR) Keep it under your Hat and Don't Let the Sun Catch you Crying reinforce these ideas. The lyrics of the popular song by Joe South Games People Play seems to provide the sentiment of your dream. The fact that you are walking down a country road with your child, may be a play on words (pun), providing a clue to your music preferences. We can find Freddy Weller's country version of Games People Play, which might be of interest. Children's games are the source for so many of our behaviours later in life. You know that the man who you dated off and on was looking for you. The IIDR interpretation The Dating Game may be an interesting read for you. You seem to be showing (by role model) your daughter who slowly is getting to be an adolescent how the playmate dating game works. In simple terms we call it foreplay. I believe, that it is more important is to teach a child the rules of the game, so that stable solutions in terms of relationships, family, and marriage can be achieved. It occurs to me that the song by Crosby, Stills, Nash and Young Teach your Children also perhaps fits the sentiment of your dream. Unfortunately for children, from a psychodynamic perspective we live in a divorce culture that creates a great deal of psychological damage in our children. For further reading, the IIDR interpretations Doll's House, The Ex-Files and Mysteries of Dallas where children also play a role in the dream. In the sense of the American psychologist William James and the Swiss psychologist Carl Jung, these dreams can provide a foundation for the transpersonal aspects of games people play and dreaming. Hope that provides some insight.